Put fresh pitted cherries on skewers and freeze in freezer. Put sugar and mint in bottom of glass and muddle to release the flavor of the mint. 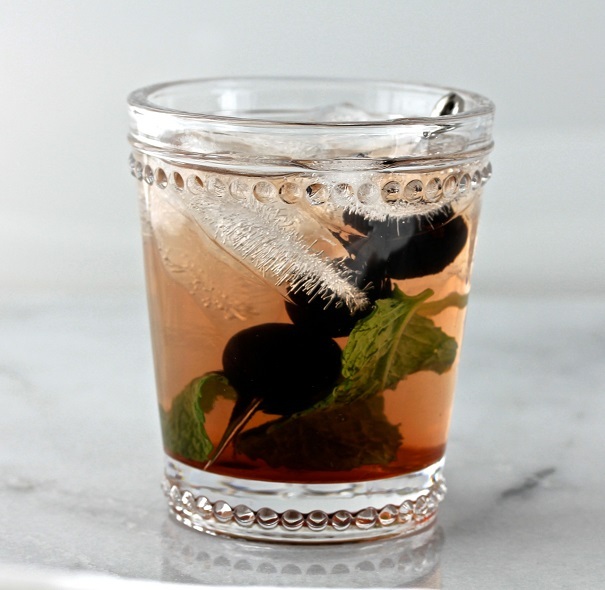 Fill glass with ice and add cherry liqueur and vodka. Note: if you can find Luxardo maraschino cherries, they will make this a transcendent cocktail. Luxardo cherries look nothing like the bright red, scarily- artificial cherries we usually see. They are dark and sweet and delicious and a drop or two of the syrup from the cherry bottle makes this drink absolutely perfect.